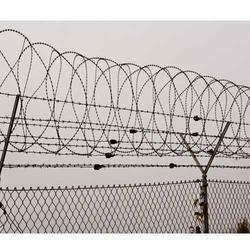 We manufacture this Barbed Wire Fence using high grade of raw material, which are procured from the reliable vendors of the industry. These can be availed in various sizes as per the needs of the customers. Barbed wire fencing is galvanized and manufactured with sharp points and edges arranged with strands at intervals and are extensively used for fencing that protects the railroad, grass land, highway and many such places. The product is available for our customers at very reasonable rates and within the specified time frame. Offered in the market at the most reasonable ret possible, the range of Barbed Wire Fence made available by us in the market, is widely acclaimed and asked for. Its superior strength, durability and resistance to corrosion, is owed to the finest raw materials and modern machines, applied in its making. Further, the range has its quality highly maintained. Looking for Barbed Wire Fence ?